It is estimated that 40,000 people died in the US Alliance’s Mosul Massacre involving the explosive demolition of a huge city of 2 million inhabitants. This is but the latest atrocity in an Iraqi Holocaust and Iraqi Genocide. Iraqi deaths from Western violence and imposed deprivation total 9 million since the British invasion in 1914. The post-tsunami peaceful settlement of the Islamist insurgency in Aceh, Indonesia, demonstrated a humane alternative to genocide. US Alliance war crimes demand comprehensive Boycotts, Divestment and Sanctions (BDS). “More than 40,000 civilians were killed in the devastating battle to retake Mosul from Isis, according to intelligence reports revealed exclusively to The Independent – a death toll far higher than previous estimates. Residents of the besieged city were killed by Iraqi ground forces attempting to force out militants, as well as by air strikes and Isis fighters, according to Kurdish intelligence services. Hoshyar Zebari, until recently a senior minister in Baghdad, told The Independent that many bodies “are still buried under the rubble”. “The level of human suffering is immense,” he said. “Kurdish intelligence believes that over 40,000 civilians have been killed as a result of massive firepower used against them, especially by the federal police, air strikes and Isis itself,” Mr Zebari added… The UN estimated that Mosul had 1.2 million inhabitants at the start of the siege” . e) Forcibly transferring children of the group to another group” . For all that ISIS was evidently barbarous and fanatical with an extremist Islamic ideology, a peaceful alternative to more US Alliance-imposed Iraqi Genocide through the near-total destruction of the Iraqi cities of Mosul, Ramadi and Fallujah was always possible. Thus, for example, the fundamentalist Muslim, Sharia Law-committed Free Aceh Movement (Gerakan Aceh Merdeka or GAM) fought against Indonesian government forces in the Aceh insurgency from 1976 to 2005, during which over 15,000 were killed. After the calamitous 2004 tsunami (170,000 Indonesians killed, mostly in Sumatra) there was a peace agreement between Aceh and the Indonesian Government in 2005 involving cessation of violence and considerable Acinese autonomy. The killing stopped at the price of imposition of Sharia Law in Aceh – thus, for example, unmarried lovers, women with a penchant for “immodest dress”, homosexuals and apostates would have their human rights and civil rights grossly violated and they would have to move from Aceh to elsewhere in Indonesia to avoid extreme medieval punishment ranging from caning to execution, but at least the war and killing stopped . 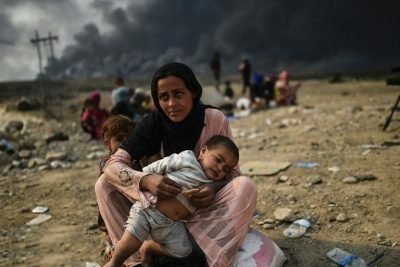 The 40,000 killed in the Mosul Massacre must be placed in the wider context of about 9 million Iraqis who have died untimely deaths from violence or imposed deprivation in over a century of Western wars against remote but oil-rich Iraq since the British invaded and conquered Iraq in 1914 with the help of British Empire colonial Indian forces and the nascent Australian air force [1, 3]. A technical examination of Iraqi history shows that the UK and its former lackey and now US lackey, Australia, are presently into their 8th Iraq War in just over a century. Indeed this appalling Western violence against Iraq is but part of a wider scene of Western violence against Humanity that has been ongoing for the last millennium in which the British have invaded 193 countries, Australia 85, France 82, the US 70 (50 after WW2), Germany 39, Japan 30, Russia 25, Canada 25, Apartheid Israel 12, China 2 and India none [3, 4, 13-18]. Detailed below are key features of the ongoing post-1914 Western Iraqi Holocaust and Iraqi Genocide that has been associated with an estimated Iraqi body count of a total of circa 9 million violent deaths and avoidable deaths from imposed deprivation. 9 million Iraqi violent deaths and avoidable deaths from imposed deprivation, 1914-1917. (a) Assuming excess mortality of Iraqis under British rule or hegemony (1914- 1948) was the same as for Indians under the British [1, 19]. one can estimate from Iraqi population data (. that Iraqi avoidable deaths from deprivation under British occupation and hegemony from 1914-1950 totalled about 4 million. (b) Iraqi deaths from imposed deprivation under deadly UN Sanctions (1990-2003) totalled 1.7 million and Iraqi Gulf War violent deaths totalled 0.2 million, for a total of 1.9 million Iraqi deaths from violence or imposed deprivation in the Sanctions period of 1990-2003. (c) US Just Foreign Policy has used data from top US epidemiologists to determine 1.5 million violent Iraqi deaths under occupation in 2003-2011 , to which we must add a further 1.2 million Iraqi deaths from war-imposed deprivation for a total of 2.7 million Iraqi deaths from violence or deprivation under US Alliance occupation (2003-2011). (d) Since the “official” US withdrawal in 2011 one can estimate from the latest Mosul Massacre data that a further 0.1 million Iraqis have died violently in the US-backed Iraqi Civil War and UN Population Division data indicate that a further 0.3 million Iraqis have died from deprivation, for a total of 0.4 million Iraqi deaths from violence or deprivation since the US withdrawal in 2011. Thus, ignoring violent Iraqi deaths under the British occupation and violent Iraqi deaths associated with the US-backed Iraq-Iran War, one can estimate about 8.8 million Iraqi deaths from UK or US violence or imposed deprivation in the century after the 1914 invasion of Iraq by Britain. Refugees from the US Alliance invasion of Iraq totalled 5-6 million [1, 2]. This is an ongoing Iraqi Holocaust and Iraqi Genocide. Even if the killing were to stop, an estimated circa 50,000 Iraqis presently die avoidably each year from deprivation in war-devastated Iraq. Depraved indifference of the International Criminal Court (ICC). As discussed further below, the 2003 invasion of was illegal and thus a war crime. The International Criminal Court (ICC) is a cowardly, racist, degenerate and look-the-other-way organization that, apart from prosecuting Balkan war criminals, confines its prosecutions to non-European war criminals. The ICC is thus a holocaust-ignoring and genocide-ignoring organization that is holocaust-complicit and genocide-complicit through its depraved indifference to Western imposed holocausts and genocides such as the ongoing Palestinian Genocide ( 90% of Palestine now ethnically cleansed of Indigenous inhabitants, 2 million Palestinian deaths from violence, 0.1 million, or imposed deprivation, 1.9 million, since 1935) , the ongoing Iraqi Genocide (9 million deaths from violence or imposed deprivation since 1914) , the ongoing Afghan Holocaust and Afghan Genocide (6 million deaths from violence or imposed deprivation since 2001, 12 million deaths from violence or imposed deprivation since the US-backed overthrow of secular governance in Afghanistan in 1978) [3, 24], and the ongoing Muslim Holocaust and Muslim Genocide ( 32 million Muslim deaths from violence, 5 million, and imposed deprivation, 27 million, in 20 countries invaded by the US Alliance since the US Government’s 9-11 false flag atrocity that killed about 3,000 people) [2, 22, 25]. It must be noted that genocide-ignoring and holocaust-ignoring is far, far worse than repugnant genocide-denying and holocaust-denying because the latter can at least admit the possibility of refutation and public debate. I have done my duty as a citizen of the world and sent a well-documented war crimes complaint to the genocide-ignoring, holocaust-ignoring and thus war crimes-complicit ICC . Indeed, in general lying by omission is far, far worse than repugnant lying by commission because at least the latter permits refutation and public debate. The US-beholden ICC and Western Mainstream media, politician and academic presstitutes in general are involved in massive “fake news through lying by omission” [26-32]. The Iraqi Genocide has been about oil. “I am saddened that it is politically inconvenient to acknowledge what everyone knows: the Iraq war is largely about oil” . “There is basically no significant change in the fundamental traditional conception that if we can control Middle East energy resources, then we can control the world” . Invasions and subjugations of Iraq were horrendous war crimes. The ultimate in racism and the ultimate in crime is genocidal invasion of other countries. The British, the French, the Americans and variously UK lackey or US lackey Australia have invaded scores of countries in genocidal enterprises over 2 centuries (the US and Australia) and over the last millennium (the UK and France). In contrast, India has invaded nobody over thousands of years and China has only ever invaded 2 countries, namely Tibet (in the 13th century) and India (in the border region in 1962). The UN Charter forbids invasion of other countries unless the invasion of a country (a) is approved by the UN , (b) is invited by the government of the country, or (c) is in response to invasion by the country to be attacked. These criteria were not satisfied in the illegal invasion of Iraq in 2003 by the US, UK and Australia that was consequently a war crime for which Tony Blair (UK), George Bush (US) and John Howard (US lackey Australia) and their associates should be arraigned before the ICC. Indeed the same criteria are not satisfied today in the US Alliance invasion of Syria (in contrast, the Russians and Iranians have been invited by the UN-recognised Syrian Government). The US Alliance and the Iranians been invited in by the Iraqi Government, remembering however, that this was installed “democratically” by the racist and war criminal Americans after they had had exiled, imprisoned, tortured, driven underground, mangled or killed the people they really didn’t like (standard practice in the American Empire from Latin America to Korea and Vietnam). The cities of Mosul, Ramadi and Fallujah were “liberated by being destroyed”. “Bush, Blair, and Howard, as leaders of the three members of the coalition of the willing, inflicted enormous suffering on the people of Iraq. And, as such, they are criminals. I believe the only deterrent to a repetition of the Iraq situation is punishment in some form as war criminals” . 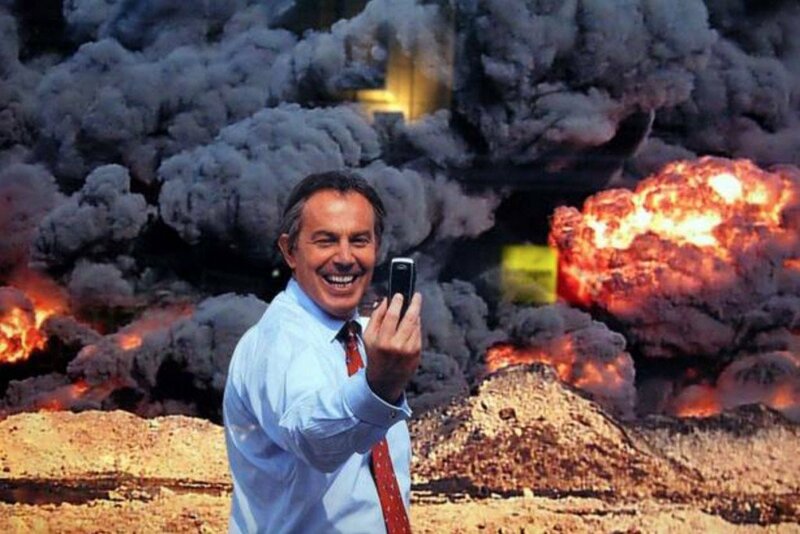 US lackeys Blair and Howard went to war on the basis of false US claims of Iraqi possession of Weapons of Mass Destruction (WMD). After the invasion no WMD were found but this begs the question of why would a militarily puny Iraq attack a nuclear-armed UK or a nuclear–armed UK even if it had WMD. “We have brought torture, cluster bombs, depleted uranium, innumerable acts of random murder, misery, degradation and death to the Iraqi people and call it ‘bringing freedom and democracy to the Middle East’. How many people do you have to kill before you qualify to be described as a mass murderer and a war criminal? One hundred thousand? More than enough, I would have thought. Therefore it is just that Bush and Blair be arraigned before the International Criminal Court of Justice. But Bush has been clever. He has not ratified the International Criminal Court of Justice. Therefore if any American soldier or for that matter politician finds himself in the dock Bush has warned that he will send in the marines. But Tony Blair has ratified the Court and is therefore available for prosecution. We can let the Court have his address if they’re interested. It is Number 10, Downing Street, London” . “How many people do you have to kill before you qualify to be described as a mass murderer and a war criminal? 9 million (1914-2017? 4 million (1914-1950)? 5 million (1990-2011)? 2 million (1990-2003)? 3 million (2003-2011)? 0.4 million (2011-2017)? More than enough, I would have thought”. (b) urge and apply Boycotts, Divestment and Sanctions (BDS) against all people, politicians, parties, companies, corporations and countries complicit in the ongoing Iraqi Genocide and the ongoing Muslim Genocide.
. “Iraqi Holocaust, Iraqi Genocide”: https://sites.google.com/site/iraqiholocaustiraqigenocide/ .
. Gideon Polya, “12th anniversary of the illegal invasion if Iraq: the Anglo-American Iraqi Genocide” , Global Research 23 March 2015: http://www.globalresearch.ca/12th-anniversary-of-the-illegal-invasion-of-iraq-the-anglo-american-iraqi-genocide/5438977 .
. Patrick Cockburn, “The massacre of Mosul: 40,000 feared dead in battle to take back city from Isis as scale of civilian casualties revealed ”, Independent, July, 2017: http://www.independent.co.uk/news/world/middle-east/mosul-massacre-battle-isis-iraq-city-civilian-casualties-killed-deaths-fighting-forces-islamic-state-a7848781.html .
. “UN Genocide Convention”: http://www.edwebproject.org/sideshow/genocide/convention.html .
. “Aceh”, Wikipedia: https://en.wikipedia.org/wiki/Aceh#Aceh_War .
. “9 January 2010 Formal Complaint by Dr Gideon Polya to the International Criminal Court (ICC) re US Alliance Palestinian, Iraqi, Afghan, Muslim, Aboriginal, Biofuel and Climate Genocides”, Climate genocide”: https://sites.google.com/site/climategenocide/bangladesh-civil-society-organizations .
. Gideon Polya, “Australian ABC and UK BBC fake news through lying by omission”, Countercurrents, 2 May 2017: http://www.countercurrents.org/2017/05/02/australian-abc-and-uk-bbc-fake-news-through-lying-by-omission/ .
. Gideon Polya (1998), “Jane Austen and the Black Hole of British History. Colonial rapacity, holocaust denial and the crisis in biological sustainability”, G.M. Polya, Melbourne, 1998, 2008 that is now available for free perusal on the web: http://janeaustenand.blogspot.com/ .
. Peter Beaumont and Joanna Walters, “Greenspan admits Iraq was about oil, as deaths put at 1.2m”, The Observer, 16 September 2007: http://www.theguardian.com/world/2007/sep/16/iraq.iraqtimeline .
. Noam Chomsky quoted in Sherwood Ross, “Chomsky: Iraq invasion “major crime” designed to control Middle East oil”, The Public Record, 3 November 2009: http://pubrecord.org/nation/5953/chomsky-invasion-major-crime/ .
. “Howard is a war criminal,, says former colleague”, Sydney Morning Herald, 19 July 2004: http://www.smh.com.au/articles/2004/07/18/1090089035899.html .
. Harold Pinter, “Art, Truth and Politics”, Countercurrents, 8 December 2005: http://www.countercurrents.org/arts-pinter081205.htm .